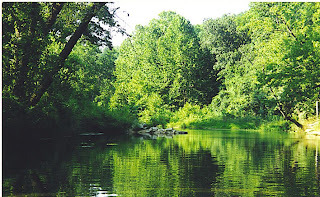 The Fly Fishing Rabbi: Praying for Trout? As The Fly Fishing Rabbi, sometimes people ask me if my prayers for trout to rise are answered more readily than those of everyone else. I think not. I’m just as likely to get rained on, or to lose my fly in the dark or not to catch a single fish as anyone else. 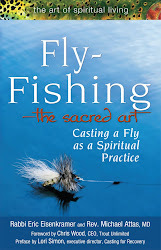 As I thought about praying on the stream, I asked myself: What should we pray for when fly fishing? Is there such a thing as a blessing for fly fishing? In Judaism there are two types of prayers, petition and thanksgiving. When we say “Come on, just one bite,” we offer a petition, asking for something specific. But I am not sure that this is really a prayer. To pray usually means bringing God into the equation. At my Temple, we say a healing prayer, called the mishebeirach, each week at services. I look around the sanctuary and ask people to share the names of those that are ill. And then we sing and pray together that they will find healing. Asking for a fish to rise is not exactly a prayer. It is a wish. Asking God to heal a person is a prayer. There are prayers that are good for fly fishing, and they are prayers of thanksgiving. Ironically, I am more likely to say a prayer of thanks when I am not catching fish. When the trout are rising, I am to busy or excited to think about anything but the fishing. But when the water is silent, and I cannot get a bite, and I am not too frustrated, then I sometimes take a moment to look around. I watch the river flow by. I feel the breeze. I smell the pine needles. Picture: A beautiful stream to be thankful for. When I see the beauty of nature, I ask myself: How did such an amazing earth come to be? What did I do to deserve to live in such a beautiful place? Feelings of awe, connection and humility come to me. And then I am led to a simple response: “thank you.” Saying “thank you” when fly fishing is to acknowledge that this earth we live on is a gift. Saying “Dear God, thank you” when on the stream is to offer up a prayer. In Judaism, there is a formula to begin a blessing: Baruch Atah Adonai, Eloheinu Melech HaOlam, Blessed are you, Adonai our God, Ruler of the Universe. Then you add thing for which you want to say “thank you.” Sometimes when fly fishing, I speak the words of this blessing from Jewish tradition: Blessed are you, Adonai our God, Ruler of the Universe, Creator of light and darkness, Maker of peace, Creator of all. A beautiful post. I sometimes find myself similarly moved on rivers, but the religious (in my case, the appropriate word is "churchy" ) doesn't always attatch well to the experience. The simplest utterance often is the best. Well said. Mind if I borrow your words? Go right ahead and borrow! Thank you, Rabbi. Good words. May you catch a trout so large you need not lie!